Important note: If the Theme being used originated from the Shopify Theme Store, then a valid purchase of that Theme is also required on each account for a valid license, in order to use that Theme. As such, the destination store will also need to purchase a valid license for that Theme as well. Without a valid license, merchants are not able to receive support for the Theme from the respective Theme developer. At this time, Shopify unfortunately doesn't allow third-party apps (such as Replay) to access the Files section of your shop. 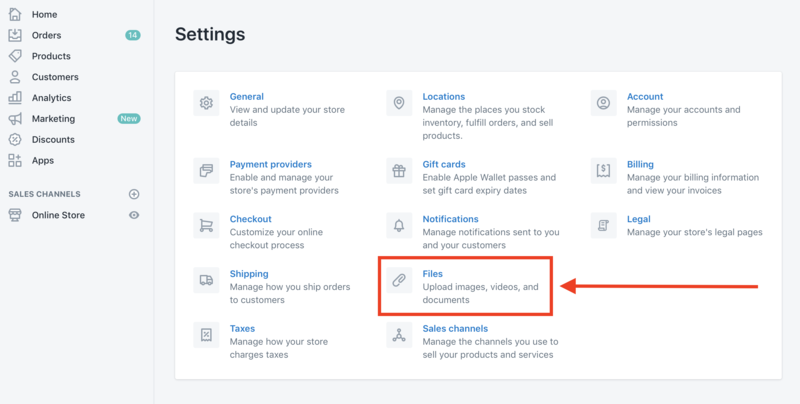 This would be any files/documents you've uploaded into your store using the Files Uploader located within your Store Settings. If you've used this Files Uploader to add Images into your Theme, then when you use Replay to copy your Theme to your destination store, it will exclude these Images, since they aren't located and stored within the Theme itself. However, if your Theme contains Media/Image Files from the Files section of your Store Settings, then once the Theme has been copied, Replay will automatically email you with a confirmation of completion, as well as a ZIP file containing all of the Files the app located within your copied Theme. Note: We recommend creating a new folder on your Desktop and having it ready before you begin, where you can save these Images. The simplest we can make this, the better! 2. 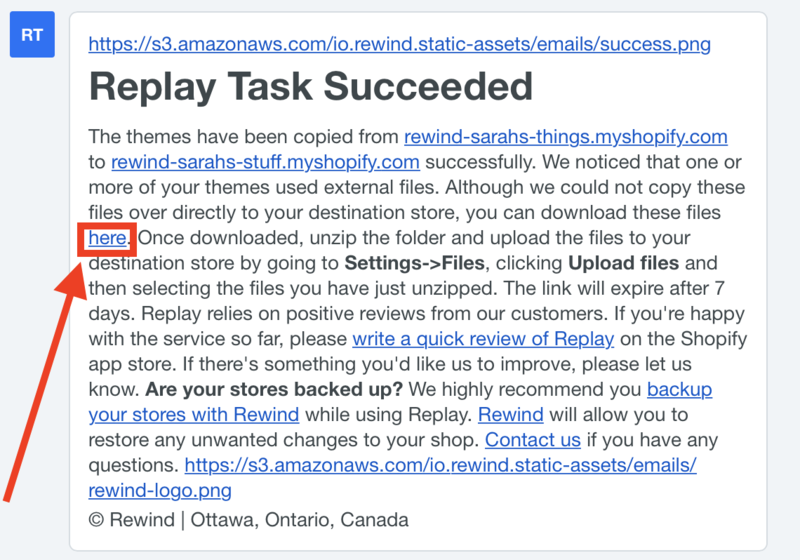 If your Theme contains any Files from the Files section of your Store Settings, they'll have been compiled within a ZIP file and included within this email from Replay. The sentence you'll be looking for is: "Although we could not copy these files over directly to your destination store, you can download these files here." Click on here to automatically download the ZIP folder containing your Theme's Files. 3. Go back into your destination store. At the bottom left-hand corner of the page, click on Settings. 4. From your Store Settings, select Files. 5. From the upper right-hand corner of the page, click Upload files. 6. Locate the ZIP folder, titled "asset_files", and then open it. From there, select everything within the folder and then click Choose. All of the Media/Image Files within the ZIP folder will then be uploaded in bulk to your Store Setting's File section.